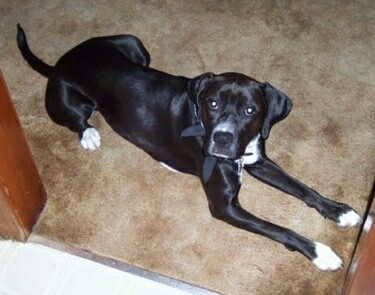 "This is my Boxer / Lab (Boxador) Stormie. She is approx. a year and a half old. We saved her from a shelter last November. She loves lying around, playing fetch and going for rides in the truck. She likes playing outside and going on walks and does great with other dogs and kids. She always wants to play and can sometimes be a handful. I will never have another dog other than a Boxador. They are loyal and very smart dogs. My dog wants to be with you at all times, no matter what is going on; whether it be mowing the yard or going to the bathroom, she always wants to be there. When we got her from the shelter she didn't know how to sit, stay or anything. In one month she knew sit, down, roll over, stay, and kennel. She is very smart but I don't know if that is always a good thing, either, as she has figured out a way to get out of her kennel when she wants to." Reese the Boxador (Lab / Boxer cross) as a 3-month-old puppy—her mom was a chocolate Lab, her dad was Boxer. Reese the Boxador (Lab / Boxer cross) as a 3-month-old puppy taking a nap. Reese the Boxador (Lab / Boxer cross) as a 3-month-old puppy—she and Mittens the kitten are great friends, although they play pretty hard! Ajax the Boxador (Boxer / Labrador hybrid dog) at 8 years old—"He is the sweetest, most lovable, most loyal dog my family has ever had. His owners gave him to us when he was a puppy, because he would never stay at his home; he was always coming over to our house."